The head of a supermarket chain in Latvia has lost his job over controversial comments he made after the collapse of a shop in Riga. Gintaras Jasinskas, chairman of Maxima Latvia, sparked anger by saying: "It is those who feel guilty who resign." His remarks came after he was asked whether any company executives would follow Prime Minister Valdis Dombrovskis' lead and step down. 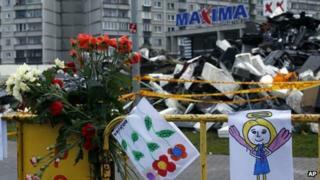 At least 54 people died when the Maxima supermarket collapsed last Thursday. Asked about the disaster, Mr Jasinskas said he felt "responsible, but not guilty", adding that he could "look people in the eyes". Maxima, which has its headquarters in neighbouring Lithuania, operates supermarkets in all three Baltic states. "Most shocking and arrogant statement by Maxima Latvia CEO refusing to assume any responsibility for [the] tragedy..." he said on Twitter. The foreign ministry summoned Lithuania's ambassador Ricardas Degutis to demand an explanation, according to local media. Mindaugas Bagdonavicius, Lithuanian chief executive of the Maxima Group, later announced Mr Jasinskas had been sacked over Thursday's remarks. "Shareholders have decided to dismiss from his position the chairman of Maxima Latvija Gintaras Jasinskas for his unacceptably expressed opinion at this painful and difficult time for Latvia's nation," Reuters quoted Mr Bagdonavicius assaying. The Latvian prime minister announced his resignation - and thereby the fall of the his government - on Wednesday. "Considering the tragedy and all related circumstances... a new government is needed that has the clear support of parliament," he said. President Berzins earlier described the disaster as "murder" and called for foreign experts to investigate what had happened. He was quoted by Baltic news agency Delfi as saying: "I call on all who look to the future to assess their responsibility and act accordingly." Mr Berzins is now considering appointing a new government. Elections are not scheduled until October next year. The collapse was the biggest loss of life since Latvia became independent from the USSR in 1991. Police have opened a criminal investigation into the cause of the disaster. Structural experts have suggested that the supermarket building itself may have been badly designed and so not able to support a garden that was being built on the roof. Substandard construction materials and corruption are other possible lines of inquiry.